Spring and summer are among us which means it’s almost sandal season. Unfortunately for those with plantar fasciitis, finding the right sandals can be somewhat hard. Sandals tend to have less support than closed toed shoes, which can aggravate ligament damage and cause sharp pains to the arches of the feet. Thankfully, there exist many great and affordable sandals designed to give the extra arch support needed to prevent plantar fasciitis, we have listed them below. It’s important to know that one of the causes of plantar fasciitis is overpronation of the tissue that runs from your heels to your toes. Rolling your feet too far inward puts strain on these ligaments and can exacerbate damage to the arches. Thus, the best sandals for plantar fasciitis compensate for this overpronation by giving more support to the inward arches of the feet and the heels. OOFOS may be one of the most sought after brands for shoes related to treating plantar fasciitis. These 100% synthetic unisex sandals have been specifically designed by podiatrists to help those suffering from pain from plantar fasciitis. Like most of the popular insoles for plantar fasciitis, The insole is made from special foam and absorbs up to 37% more impact than traditional foams, meaning there is less chance of overpronation. The specially contoured shape supports your arches and reduces stress on sore feet, knees and the back. The slip-ons are designed as one piece and are machine washable, so don’t worry if you get any muck on these. The OOFOS Ooah slide sandal is great for after-sport wear as they can rehabilitate any damage taken to your arches. The synthetic material is moisture resistant so you can get them wet and won’t have to worry about any funky smell from moisture-dwelling bacteria. Designed by podiatrists for treating and recovering from plantar fasciitis. The Ecco Yucatan offers a durable hiking sandal for both men and women. The sandal is made from quality materials and has an EVA footbed with a microfiber cover for stability and comfort. Described by one customer as “walking on a cloud” the Yucatan give you comfort in a structure meant to relieve foot pain. The RECEPTOR technology in the insole absorbs more impact shock than other kinds of materials. The polyurethane midsole gives extra support to the feet and centers your foot for reduced knee and back pain. The rubber outer sole is extremely durable and will last for a long time while also being machine washable. The Vionic Unisex wave Sandal is a great option for men and women who need good arch support but don’t want to break the bank. The very affordable sandals have a nylon weaving upper, an EVA footbed, and durable rubber outsole for long-lasting wear. Like all Vionic products, the Wave Toe-Post sandal comes with their signature footbed that APMA certified and clinically proven to alleviate pain from plantar fasciitis and other foot conditions. The podiatrist-designed footbed brings up your arches and keeps your feet from falling inward while you step. Extra space in the toe bed allows for better balance and the fabric and rubber sole are both machine washer safe. The SOARFREE plantar fasciitis flip flop sandals are designed to emulate the feeling of bare feet in wet sand. The anatomically designed contours of the sole are designed for maximum arch/heel support and comfort. The key design feature of the SOARFREE is the medial and lateral arch support that reduces the overpronation that leads to plantar fasciitis. The design minimizes side-to-side movement, provides shock absorption and gives stability to the lower parts of the foot. The arch and heel cup work together to reduce pressure on the arches and minimize pronation. The large toe box lets you spread your toes wide so you get the maximum balance on the front of your foot. The heel design also centers your foot and leg, which can be helpful for minimizing ankle and knee pain. The Chaco ZX/2 Classic carries with it the Chaco name that has been known for its quality sports and outdoor footwear. The ZX/2 Classic is a premium outdoor sandal made for hikers and the outdoor-minded. The unique LUVSEAT platform gives extra support to the arches and is officially certified by the American Podiatric Medical Association (APMA) to help relieve foot heel and arch pain. The simple design is only composed of 8 parts and contains custom adjustable straps to fit the unique shape of your foot. The outer sole tread is specifically designed for performance tread in extreme circumstances and superior wet traction. All Chaco midsoles are made out of a tough durable polyurethane compound that is resistant to degradation from nature. This makes the sandals last longer than competitors and they won’t fray or chip away over time. The Vionic Samoa Slide Sandal is a great mix of comfort and casual style. The classy gilded style and hook-and-loop strap closures look great and are easy to fit to any foot. The leather and textile upper padding are soft and won’t irritate the tops of your feet. Vionics patented Orthoheel technology is APMA certified and has been shown to reduce symptoms and pain associated with plantar fasciitis. The soles are biomechanically designed to hug your arches and keep the heel elevated and centered. The durable outer sole is designed for tread on a wide variety of surfaces, and the heel-centering design also reduces pressure and pain in the knees. The Taos Trulie Wedge Sandal is one of the best casual women’s sandals for plantar fasciitis It is also useful for alleviating symptoms related to arthritis, osteoporosis, ankle issues, and back problems. The 1.5 inch elevated heel slopes gently down towards the toe, which assists your natural gait and keeps you from putting pressure on the insides of your arches. The adjustable hook-and-loop straps allow for maximum comfort and adjustability and the leather/synthetic upper layers won’t irritate the sides or tops of your feet. The straps are fastened below the midsole which means you won’t have to worry about your straps and midsole becoming unseparated. The rubber soles can handle multiple surfaces so these sandals are useful no matter if you are walking in the park or on the hard linoleum floor of a building. The earthy fabrics, embellished designs, rustic buckles, and stones are inspired by the warmth and vibrancy of the New Mexico landscape. Multiple color options ensure you have the right sandal for your style. From hiking to river portaging to taking a simple stroll in the park, the Keen Women’s Whisper Sandals are a must-have for anyone who has a taste for adventure. The Keen Whisper Sandals are designed specifically for women’s feet in mind and all the unique issues they may face. Made for use in aquatic environments, the thick 100% polyester design is completely waterproof and the bungee lace capturing system holds the footbed tight to the sole of the foot. The metatomical footbed is anatomically engineered to give excellent arch support and cradle the foot. A large amount of color options lets you pick the sandal to fit your style. The Chaco Men’s Flip Ecotread combines the best of an outdoor strap sandal with the comfort and ease of wear of a flip flop. The thick polyurethane sole and midsole is built to last and the extra treaded soles are made for all kinds of surfaces. The high tensile toe post ensures that the thong will not come loose over time from wear. Like all Chaco’s products, the Men’s Flip comes with their signature LUVSEAT sole technology that has been clinically proven to reduce pain from plantar fasciitis. The sandal is also designed to be environmentally friendly. The patented Ecotread design of the soles is made from 25% recycled rubber that is non-toxic on the environment. Aside from its biomechanically efficient design, the Men’s Flip is extremely customizable so you can express your unique style. The sole, logo, tag, footbed, inner, and outer strap are all completely customizable with different colors and patterns. You can even add personal specifications so that the sandals are tailored specifically to your unique footprint. Among some of the most well-known men’s sandals, The Drew Shoe, designed by famous American fashion icon Andrew Warren, are specifically designed for orthotic foot issues. The hiking-sandal inspired designed is made from high-quality Nubuck leather meant for comfort and durability. 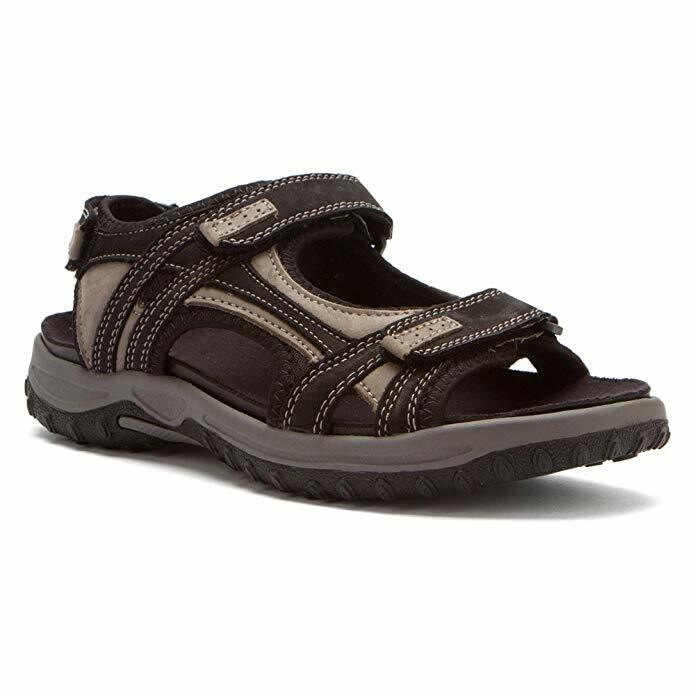 The Drew Shoe men’s sandals use special ULTRON brand removable footbeds. ULTRON footbeds have been independently confirmed to lesse foot compression and prevent overpronation. Three-point adjustability with velcro hookups ensures that the footbed hugs your foot through the whole walking motion. The extra deep and cushioned design is made for people who have moderate to extreme foot issues. Designed with comfort and style in mind, the Birkenstock Arizona Soft Footbed is a great looking sandal recommended for those with plantar fasciitis. The elegant and classic two-strap design offers a secure attachment to the feet and also looks fantastic. Birkenstock’s trademark contoured cork footbed is made to not only mold to your specific footprint but help guide your foot into a more comfortable position. The soft mold supports your arches and backs of the heels, align your foot and ankle for reduced pressure on the knees, and gives extra room to your toes for superior balance. The durable upper synthetic fabric is soft and easy to wash.
A characteristic feature of Birkenstocks is that they mold to your feet over time, and the Arizona Soft Footbed is no different. The footbed is designed to feel and fit your feet like walking barefoot in the sand. Flip flops or full foot sandals? The first thing to ask is if you just want some simple flip flops or sandals that strap all over you’re feet. Flip flops tend to be better for comfort/lounging wear, though if you want to move around more n your sandals on different terrains, a full-strap sandal is a better choice. RELATED: A night splint can be a great solution for your PF. Make sure to check our post: “Best Plantar Fasciitis Night Splints“. Sometimes, having a removable footbed is very useful. Every persons’ feet are different and in different proportions. A removable footbed gives you an extra bit of customizability with how your shoe fits. One of the couses of plantar fasciitis is overpronation due to improper shock absorption. Improperly designed sole do not absorb enough shock to transfer the force from the soles of your feet and can contribute to arch damage. Finding sandals with good shock absorption is crucial for treating plantar fasciitis. If you want to experience maximum shock absorption go and check our post about running shoes for plantar fasciitis.